So who are we? We’re best friends that live about 1400 kms apart having both moved for work. Apart from talking, emailing, skyping and generally communicating every day, we also like to blog about our adventures on bikes – both the ones we have with each other, and the ones we have in our day to day lives. We are passionate about lots of stuff to do with cycling. Whether is flogging down single track, riding to work, cycle touring, road riding or just pottering round on our bikes, we love it all. We also have a quest to find fashionable, functional, stylish and technical bike gear. Stuff that looks good on and off the bike. Lastly, we want to get more girls on bikes! For every woman that cycles, there’s two men that ride. We need to turn that number around. In the blog we’ve included tips and tricks that have helped us – like how to ride in cleats or how to keep your seat dry when it’s raining. We’re not professing to be experts, but just sharing how we’ve overcome biking obstacles. Anyhow, we hope you enjoy Two girls and their bikes. Hope to see you riding somewhere! Great blog! See you on Cycle Queensland! 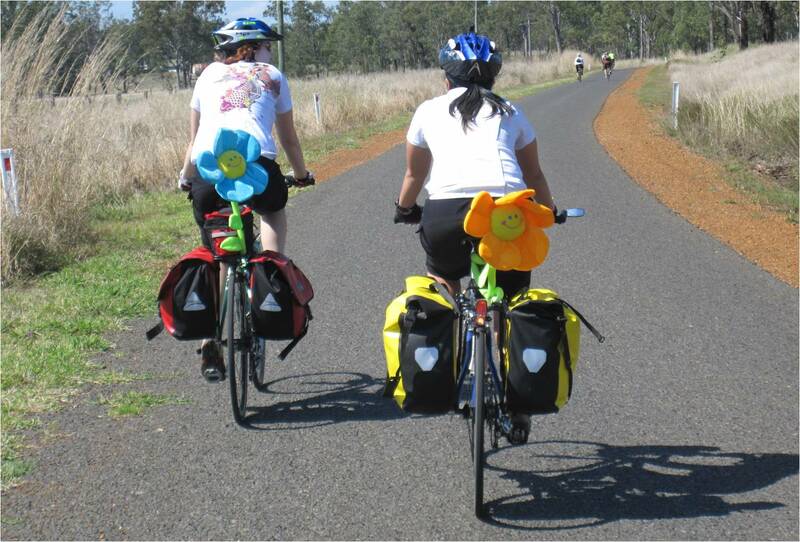 Hi Nat, We met you on the cycle qld ride last year. Really enjoyed the experience and people we met. Thinking about doing this years ride and wondering if you were planning to go this year also. Ps great blog. Hope to hear from you when you get a chance. Jo, Brett, Oscar and Gemma. Probably not going to CQ this year as it just hasn’t come together on the timing. Planning a 1 week self sufficient tour in NSW instead. Hey, I saw you guys on the 2010 yeppoon to bundy. Good luck for this yr Goondi to bris, I couldn’t make it this yr but keep a lookout for my friend di selwood from Darwin she will have NT. Flag flying off her tent.